January 27, 2014. Making his third flight as a NASA astronaut, University of Colorado Boulder alumnus Steve Swanson will blast off for the International Space Station aboard a Russian Soyuz spacecraft from the Baikonur Cosmodrome in Kazakhstan on March 25. Swanson, who earned a bachelor’s degree in engineering physics from CU-Boulder in 1983, will serve as flight engineer for Expedition 39, which already will be underway on the ISS. In late May, Swanson, who considers Steamboat Springs, Colorado his hometown, will become space station commander as Mission 40 begins on the ISS. Swanson previously flew on the STS-17 mission aboard the space shuttle Atlantis to the ISS in June 2007 to deliver a truss segment, solar arrays, batteries and associated equipment. Swanson participated in two spacewalks totaling 13 hours and 45 minutes during the mission, the 21st shuttle mission to the orbiting station and which returned to Earth with Swanson and his fellow astronauts 14 days later. He also flew on the STS-19 mission aboard Discovery in March 2009, delivering the final starboard truss segment and the final set of solar arrays and batteries, all of which were installed during spacewalking trips by Swanson and two astronaut colleagues. Swanson spacewalked for 12 hours and 37 minutes on the 13-day mission. Swanson will be launched to the ISS in March aboard the Soyuz spacecraft along with cosmonauts Alexander Skvortsov and Oleg Artemyev of the Russian Federal Space Agency. Expedition 39, which will be commanded by Japanese astronaut Koichi Wakatato, will end in May, when Expedition 40 begins with Swanson as commander. The astronaut crew will be involved in dozens of research experiments in the low gravity of the ISS, including efforts related to protein crystal growth, capillary blood flow, gravity sensing by plants and muscle and bone loss changes in space. Swanson and the two cosmonauts will return to Earth in September. 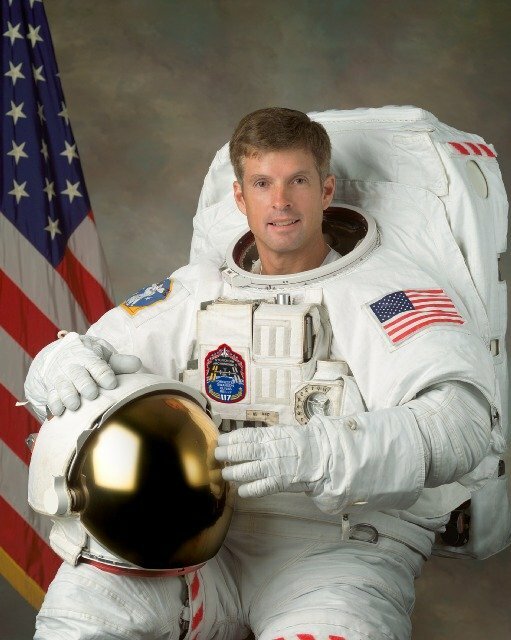 “Steve is a Coloradan and CU alum and I know that like many of us, he’s a camping enthusiast,” said CU-Boulder Scholar in Residence and former astronaut Jim Voss, who received his master’s degree in aerospace engineering from CU-Boulder in 1974. “After making two shuttle flights where he camped out for a week or so, he’s now going to the International Space Station where he gets to camp out and work for six months. Eighteen CU-Boulder astronaut-affiliates have flown 47 NASA space missions beginning with the late Scott Carpenter in 1962. Former NASA astronaut Joe Tanner, currently a senior instructor in CU-Boulder’s aerospace engineering sciences department and who is teaching and mentoring undergraduate and graduate students in space systems design, flew four space shuttle missions, including one to refurbish the Hubble Space Telescope in 1997 and two to the ISS. To watch a video of Swanson talking about his NASA experiences and his passion for Colorado’s outdoors visit http://www.youtube.com/watch?v=KU53X7O7z7w.